Tour begins promptly at 11am. Please allow yourself a sufficient amount of time to find parking and arrive at the location. For groups of 10 or more, please contact us before reserving tickets. Detroit is a city rich in history, grand buildings and vibrant art surrounding public places. Walk with Detroit Experience Factory & PureDetroit through the downtown area as we explore some of the great contributions of prolific architects and emerging artists. On this one-hour tour, we’ll travel through The Belt, step inside One Campus Martius, wave to the Spirit of Detroit and end our tour at the PureDetroit shop inside the grandeur of the majestic Guardian Building. These tours are made possible with support from Bank of America and your donations. For groups of 10 or more, please contact us before reserving tickets. Billions of dollars in development have happened along the Woodward Corridor in recent years and Downtown is at the epicenter of it all. On this tour you’ll see all the major developments as well as unique shops, one-of-a-kind restaurants and recently renovated residential options. New Addition! See downtown filming locations of Batman v Superman. You’ll also see some of Detroit’s great historical spots and its world renowned architecture. Depending on the tour we will either walk for the entirety or utilize the People Mover, so please dress accordingly. Tour begins promptly at 2pm. Please allow yourself a sufficient amount of time to find parking and arrive at the location. For groups of 10 or more, please contact us before reserving tickets. The Downtown Detroit Riverfront is a public space constructed through a unique public-private partnership. When finished, the promenade will extend for 5½ miles from the Ambassador Bridge to Belle Isle Bridge. Approximately 3 miles of the Riverwalk are currently completed. It is anchored by Rivard Plaza which offers free parking, bike rentals, concession stands, and carousel rides. When you join the Detroit Experience Factory on the Detroit Riverfront Walking Tour, we will meet on the world map on GM Plaza just off the riverfront, directly behind the Renaissance Center. Tour begins promptly at 12pm. For groups of 10 or more, please contact us before reserving tickets. 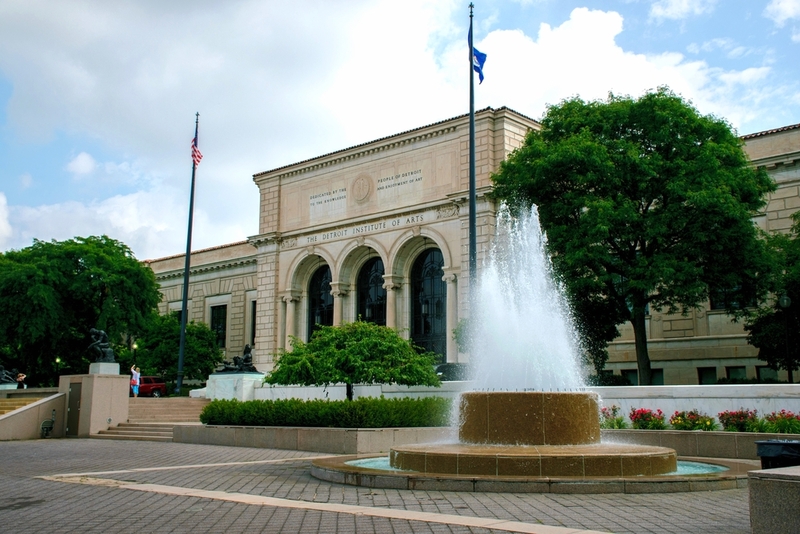 The Cultural Center, also known as Midtown, is the neighborhood surrounding Wayne State University and the museum district and running south toward downtown. It is home to five major museums, a large state university, and a flourishing artist community. It has always contained a lot of apartments , and many loft and condo rehabilitation projects have been completed on the Cass Corridor, another common identifier for the area. Tour begins promptly at 6pm. For groups of 10 or more, please contact us before reserving tickets. Detroit's food scene is exploding, so much so it seems that a new restaurant opens every week. With so much new to choose from, as well as classic standby's how is any one consumer of fine fare to choose? Let the Detroit Experience Factory help you sample five of the cities' finest eateries, and learn a thing or two along the way. Tantalized taste buds and fascinating facts make this one of our most popular tours, so don't wait one moment: Sign Up Today!